Balalaika Russe was the premier Russian Cabaret Orchestra in the United States for over twenty years. This colorful sextet has performed from Washington to Maine and Europe, at such venues as society balls and affairs, at local church halls, outdoor concerts and festivals, weddings, club dates, and on the concert stage. 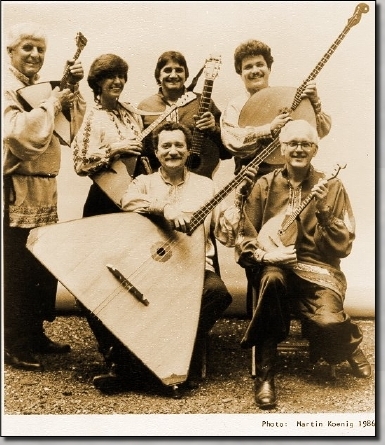 The Balalaika Russe is the preferred band of the Russian nobility emigre society, performing at such functions as the Petrouchka Ball, the Nobility Ball, the Theological Ball, and at the Tolstoy Society. BILL MELICK (prima balalaika), leader of the Balalaika Russe, studied with Alexander Kiriloff in the 1930's, and got his exposure to balalaika music from his family, who owned several Russian restaurants in New York City. His performance in Khovanshchina (the Mussorgsky opera, Eve Quiler conducting) with the New York Symphony Orchestra, highlights a long career of club, stage and television appearances throughout the United States and Europe. GARY NOVA (voice and guitar) has been singing Russian and Ukrainian songs ever since he can remember, starting out as a youth in his native Ukraine, and picking up the guitar somewhere along the way. Known as "The Russian Crooner," he has made many appearances throughout the United States and Europe, in places such as Lincoln Center in New York City, and The Palace in Gstadd, Switzerland. His recording on the Armen label of "I Remember Russia," a fine example of his talent, has been extremely popular in the Russian emigre community in America. ALEXANDER ALEXANDROVICH (prima domra), as lead player, makes a tremendous contribution to the group's distinctive sound. In his early years, Alex played with the Mark Balalaika Selivan Orchestra in New York, taking a long break from playing before returning with the Balalaika Russe. His devotion to Russian music has made him one of the finest prima domra players in the country. JUDY SHERMAN (alto balalaika) started her balalaika career in the UCLA Balalaika Orchestra, and went on to sing, play balalaika, and record and tour with the Los Angeles-based Odessa Balalaikas for seven years. She has directed the Penn Balalaika Orchestra at the University of Pennsylvania, and on numerous occasions was featured vocalist with various groups such as the Detroit Balalaika Orchestra and the Atlanta Balalaika Society. Judy is a also member of the Gypsy Balalaikas of Philadelphia. ALAN ZEMEL (bass domra) started playing Russian music with the Penn Balalaika Orchestra while he was still in high school. He has been involved in Eastern European music, playing in numerous Greek, Russian, Romanian and Balkan groups in the Philadelphia area. A versatile musician, Alan plays with true skill all the Russian folk instruments, from prima domra to contrabass balalaika. He is lead player with the Gypsy Balalaikas in Philadelphia. STEVE WOLOWNIK (bass balalaika), co-founder and former Executive Director of the Balalaika and Domra Association of America, has been playing balalaika since he was a teenager. He was integral in the founding and direction of various groups around the country, starting with the Penn Balalaika Orchestra (when he was a student there), and on to the UCLA Balalaika Orchestra, the Odessa Balalaikas, the Houston Balalaika Society, the Schuylkill Cossacks Balalaika Band, and others. Steve, Judy and Alan comprise the Philadelphia-based Gypsy Balalaikas, a group, like the Balalaika Russe, dedicated to the authentic sound of the balalaika and domra ensemble.